As part of the Engineering Education Scheme (EES), six students from Notting Hill & Ealing High School (NHEHS) together with Taylor Woodrow ambassadors visited the Building Research Establishment (BRE) Innovation Park to further develop their understanding on how to construct sustainably recently. NHEHS students are working with six mentors from Taylor Woodrow and Network Rail to assess and improve the BREEAM (Building Research Establishment Environmental Assessment Method) rating of Southall station. The students and mentors have been working together since October 2016, meeting each week to discuss and support the students while they research potential initiatives and assess how these can be implemented in Southall station to improve its BREEAM score. As part of the scheme the students have the opportunity to participate in a practical workshop to allow them to focus on their project; spend time with their mentors and gain an understanding on how to further improve their solution. 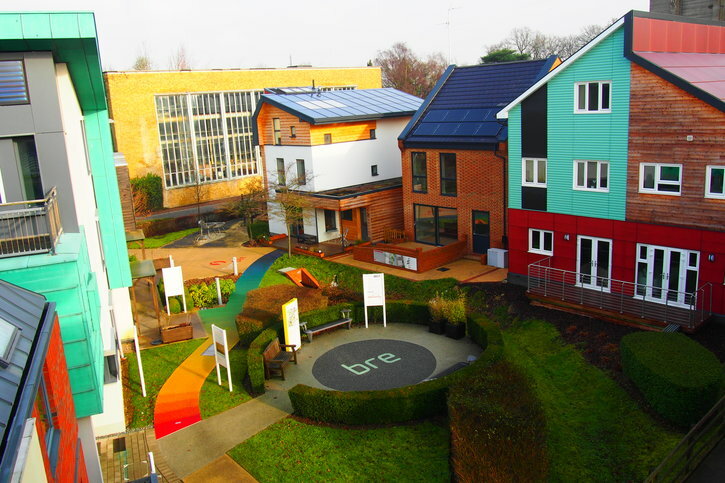 The mentors therefore organised a visit to the BRE Centre in Watford where they were guided by BRE’s Jonathan Elms through the prototype houses around their large site. “The BRE Centre visit provided the students with the opportunity to see the different sustainable materials and construction methods, provoking the students to think about how these can be applied to their project,” said Taylor Woodrow Site Engineer Kristina Rorsman. The students will also have the chance to pitch their project findings for improving Southall station’s BREEAM rating to Crossrail in March 2017. Some of their initiatives may come to fruition if a strong business case is provided. The EES project comes to a conclusion in April when the students present their findings to a panel at University of Central London.